On October 30, 2018, the UN Human Rights Committee adopted a new General comment No. 36 (2018) on article 6 of the International Covenant on Civil and Political Rights (ICCPR), on the right to life. Article 6 (para 1) of the International Covenant on Civil and Political Rights. As such, the General Comment sought to enunciate acts or omissions by States parties to the ICCPR that would violate this right. The General Comment replaces earlier Comments on the Right to Life adopted by the Committee in 1982 and 1984. 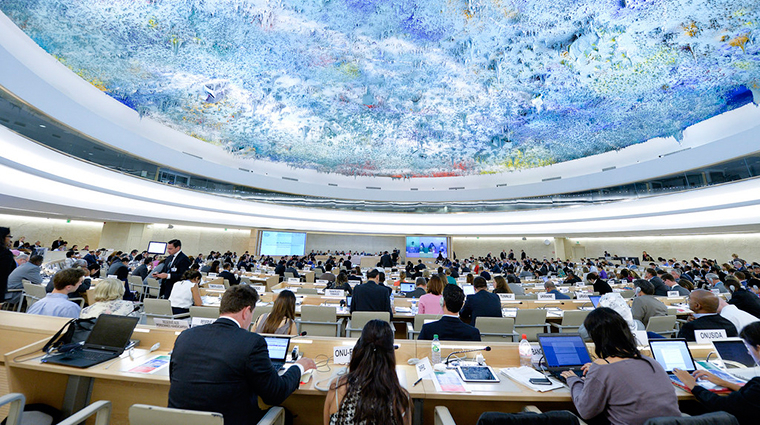 (see Human Rights Committee adopts General Comment on the right to life). Amongst other things, the new General Comment condemns the threat or use of nuclear weapons and other weapons of mass destruction (WMD) as a violation of the Right to Life, possibly amounting to an international crime. And it affirms an obligation of States Parties to the Covenant to end the production of WMD, destroy existing stockpiles and provide adequate reparation to victims of their testing or use. ‘The threat or use of weapons of mass destruction, in particular nuclear weapons, which are indiscriminate in effect and are of a nature to cause destruction of human life on a catastrophic scale is incompatible with respect for the right to life and may amount to a crime under international law. States parties must take all necessary measures to stop the proliferation of weapons of mass destruction, including measures to prevent their acquisition by non-state actors, to refrain from developing, producing, testing, acquiring, stockpiling, selling, transferring and using them, to destroy existing stockpiles, and to take adequate measures of protection against accidental use, all in accordance with their international obligations. The new General Comment is extremely significant because of the comprehensive legal condemnation it provides on threat, use, production and possession of nuclear weapons and other WMD, and because the States Parties to the Covenant include most of the nuclear armed States and their allies under extended nuclear deterrence doctrines. (See Contribution of the General Comment to nuclear abolition below). See Observations of the United States of America On the Human Rights Committee’s Draft General Comment No. 36 On Article 6 – Right to Life. France argued that the application of the Right to Life during armed conflict is defined (and limited) by the provisions of International Humanitarian Law, which France contends does not categorically prohibit the threat or use of nuclear weapons. A number of governments, academics and NGOs provided counter arguments to those of the nuclear armed States. The International Association of Lawyers Against Nuclear Arms argued that both the threat and use of nuclear weapons are ‘incompatible with respect for the right to life’, and cited as legal support the International Court of Justice Advisory Opinion of 1996, UN Charter Article 2 (4) and Article 51 § 2 of Additional Protocol I to the 1949 Geneva Conventions. The Human Rights Committee was not persuaded by the arguments of the nuclear-armed States. As such the Committee maintained the draft language on WMD in the final adopted text of the General Comment. Firstly, the General Comment makes strong links between human rights law and nuclear non-use and disarmament obligations. In general, nuclear constraint and disarmament issues and initiatives are considered primarily by disarmament experts, practitioners and campaigners. The human rights community has not generally paid much attention. This comment builds a bridge between these communities and helps broaden and strengthen the nuclear abolition movement by engaging the human rights movement. The bridge between arms control and human rights should now be used by civil society in its efforts against nuclear weapons before the Human Rights Committee. The Human Rights Committee, however, is only one UN body dealing with human rights within a large machinery covering very different rights and areas. NGOs fighting for a world without nuclear weapons and the rights of victims of those weapons should now use other fora, e.g. those dealing with rights of women, children or indigenous peoples, all particularly vulnerable to nuclear weapons, in order to make their voices heard. Secondly, the General Comment highlights obligations of the nuclear armed and allied States rooted in Article VI of the NPT, UN resolutions and other international law. In this respect, the comment reinforces the 1996 International Court of Justice Advisory Opinion on the Legality of the Threat and Use of Nuclear Weapons, and strengthens a customary norm applicable to all states against the threat or use of nuclear weapons and the legal obligation to achieve nuclear disarmament. Thirdly, the General Comment demonstrates an approach to advancing nuclear disarmament and non-use obligations by bringing them into related treaties to which at least some of the nuclear armed States and their allies are already parties. One such treaty in which this approach is being tried is the Rome Statute on the International Criminal Court. Fourthly, in affirming the obligation to ‘afford adequate reparation to victims whose right to life has been or is being adversely affected by the testing or use of weapons of mass destruction,’ the General Comment gives support to humanitarian initiatives relating to WMD and to victim assistance. These aspects are reflected strongly in the Treaty on the Prohibition of Nuclear Weapons (Article 6), but are absent in the Non-Proliferation Treaty, Chemical Weapons Convention, Comprehensive Nuclear Test Ban Treaty and Biological Weapons Convention. Finally, the General Comment parallels and complements elements of existing nuclear arms control and disarmament agreements providing additional impetus to their implementation. The Committee referenced (in footnote 273) the Treaty on the Prohibition of Nuclear Weapons (TPNW) – as well as the Non-Proliferation Treaty (NPT), Comprehensive Nuclear Test Ban Treaty, Chemical Weapons Convention and Biological Weapons Convention – as important treaties contributing to obligations on the non-proliferation and disarmament of WMD. With regard to nuclear weapons, the Committee referred to the 1996 International Court of Justice Advisory opinion, in affirming that ‘respect their international obligations to pursue in good faith negotiations in order to achieve the aim of nuclear disarmament under strict and effective international control,’ (ICJ reference is footnote 274). This reinforces the customary nature of the nuclear disarmament obligation, i.e. its application regardless of whether or not a State is party to the NPT or the TPNW. The Human Right Committee rejected the proposal of the Women’s International League for Peace and Freedom that the General Comment require ‘States parties [of the ICCPR] to support the Treaty on the Prohibition of Nuclear Weapons.’ Nor did it call on States not parties to other related treaties (NPT, CTBT…) to join them. In this, the Committee reflected the general understanding that States should be free to join, or remain outside of, treaties as they so choose. However, in reflecting key elements of the TPNW, the General Comment provides an example of how to bring these elements to bear on nuclear armed and allied States, none of which have joined the TPNW or are likely to do so in the near future. The drafting and adoption of the General Comment took three years, a year longer than originally expected, due to the high level of interest from governments, academia and NGOs – and due to the fact that it dealt with a number of contentious issues, including abortion, assisted suicide, non-lethal weapons, protection of sexual minorities from violence, asylum, death penalty, weapons of mass destruction and responsibility for reparations. A few of the NGOs involved in the process, in particular the International Association of Lawyers Against Nuclear Arms (IALANA) and its Swiss Affiliate the Swiss Lawyers for Nuclear Disarmament (SAFNA), were specifically engaged in the deliberations on nuclear weapons and other weapons of mass destruction. See Threat or Use of Weapons of Mass Destruction and the Right to Life: Follow-up Submissions to UN Human Rights Committee, October 5, 2017 and Threat or Use of Weapons of Mass Destruction and the Right to Life, Comments and Proposal, 7 September 2016. For more about the development of the WMD paragraph in the General Comment and its significance, see Threat and use of nuclear weapons contrary to right to life, says UN Human Rights Committee, a post by Daniel Rietiker, President of SAFNA. * Alyn Ware is Consultant for the International Association of Lawyers Against Nuclear Arms, International Representative for Aotearoa Lawyers for Peace (New Zealand) and former Executive Director of the Lawyer’s Committee on Nuclear Policy (USA).